ELKINS — In November, the Central Appalachian Spruce Restoration Initiative (CASRI), with financial support from The Nature Conservancy’s (TNC) Central Appalachians program and the West Virginia Highlands Conservancy, held the ‘Partnerships for Connectivity’ conference at the Canaan Valley Resort & Conference Center in Davis, West Virginia. Nearly 60 participants from CASRI partner groups, non-profit organizations and state and federal agencies were in attendance at the two-day conference. The conference celebrated decades of success restoring the red spruce-northern hardwood ecosystem in Central Appalachia by gathering managers, practitioners, scientists and leaders in the field to discuss the latest research findings, problem-solve common management challenges and network to advance new and emerging partnerships. Long-term partnerships are invaluable to continued success in receiving funds for restoration at-scale as well as moving forward with innovative restoration methods and tools. These strong partnerships will enable the network to continue to advance landscape resilience and connectivity of red spruce forests across the region. 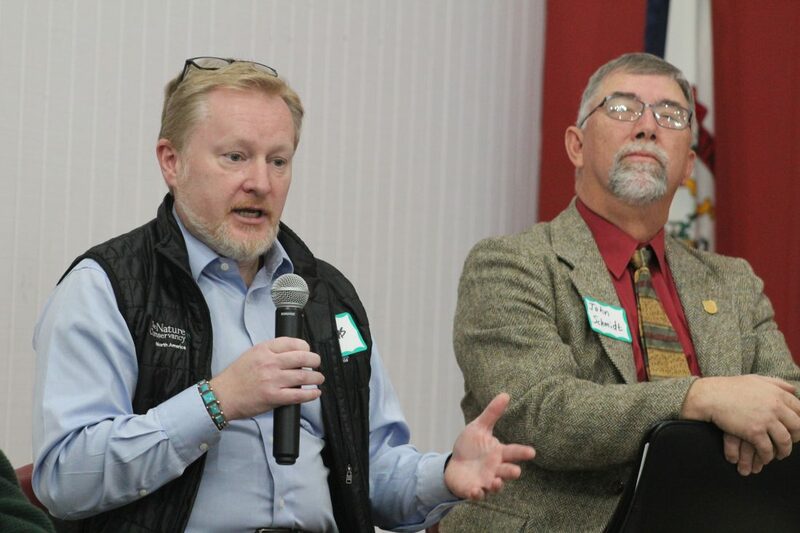 Thomas Minney, state director of The Nature Conservancy in West Virginia, and John Schmidt, field supervisor of the West Virginia Field Office of the U.S. Fish and Wildlife Service, present opening remarks to conference attendees. Laura Bray, program coordinator for the Pennsylvania Environmental Council, a first-time participant, found the opening panel to be particularly moving. Throughout the conference, attendees were able to sit down with some of the area’s leaders in conservation and restoration, including partners from West Virginia University, the Monongahela National Forest, Virginia Polytechnic Institute and State University, the Appalachian Mountains Joint Venture, the U.S. Department of Agriculture, the Department of Natural Resources, TNC, the Office of Surface Mining Reclamation and Enforcement, the University of Maryland, the U.S. Forest Service and the West Virginia Division of Forestry. Field trips to local spruce restoration sites were also available and were led by Mike Powell, director of lands at TNC WV, and Dawn Washington of the Canaan Valley National Wildlife Refuge. The CASRI partnership is open to anyone interested in red spruce restoration and conservation. Interested parties are encouraged to contact Katy Barlow at kathryn.barlow@tnc.org to become more involved with the network activities.